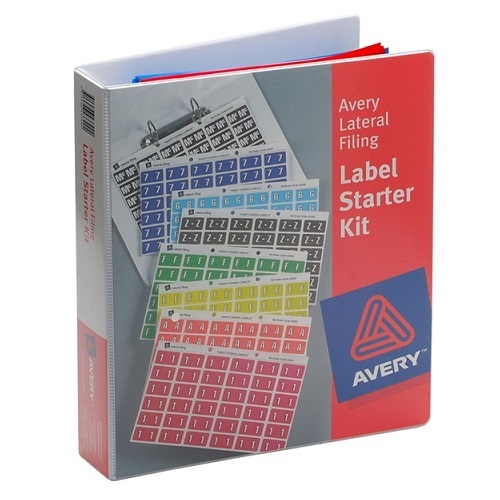 Imagine all your files are coded with Avery® colour coding labels. It's literally impossible to misplace your files because each letter and number is given a different colour. So even if you or someone else makes a mistake, you can still easily identify the misplaced files according to the colour coding. Avery Colour Coding Labels are available in alpha, numbers, year code, months and forward slash. Simply apply selected labels on the side of the file. It's that easy! 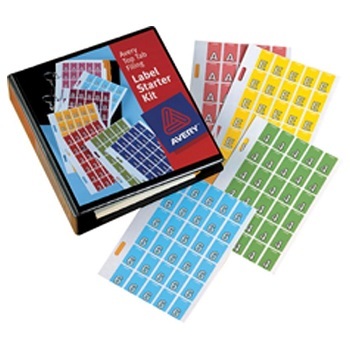 Avery Label Starter Kits (please see below) are perfect for the first timer or low usage. Alternatively order the individual packs of your choice of alphabetic, numeric or year labels. Assorted Colour Side Tab Colour Coding Labels Starter Kit. Kit contains 2 sheets (72 labels) of each alpha and numeric code labels. Each alpha and number is given a different colour for easy identification. Apply labels on the side of your files. Suitable for Shelf Lateral files and Fullvue files. Binder is refillable with standard colour coding labels. Assorted Colour Top Tab Colour Coding Labels Starter Kit. Kit contains 2 sheets (60 labels) of each alpha and numeric code labels. Apply labels on the top of your files. Suitable for Twin Tab Lateral files, Fullvue and Quickvue files.